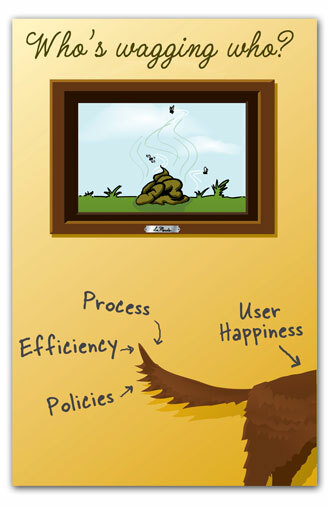 Creating Passionate Users: What tail is wagging the "user happiness" dog? I am in a different business called the church. But when you move from a church where a few hundred show up to where a few thousand begin to show up…it is very hard to transition from mom and pops church to a church that looks out for the whole instead of the few. OR, instead of a dog, putting some pictures of typical or actual users up, so people can be very specific about who they really need to satisfy. Reminds me of when I worked for one of the big boy phone companies. We had to fulfill a quota by department for TQM training completion. Big hoo-ha, big punishment if your department didn't finish. Sooo, I and my co-workers slogged through the class. One of the first meetings back, we all started to do the TQM thing and the poobah in charge said, "We don't have time for that." Oh, and the handle on my TQM mug broke off almost instantly (It was the "Q"). This seems to be the topic for blogs everywhere. It hearkens back to the idea of always keeping your audience in mind no matter if your making a movie, writing a story, or selling cell phones. Customer service should still be important, though I'm not too impressed lately. Those that don't deal with the customer on a daily basis don't have the capacity to decide how customers should be dealt with. Sadly they are the big wigs with the authority to put in place any action they want. We do need to balance company needs with customer needs, but we should keep in mind that without those customers, without an audience, we wouldn't exist. Customer-orientation should be built into everything that a company does. Over the last three years working as a customer management consultant with Toyota, I have seen how everything that Toyota does is driven by their customers. And I mean pretty much everything. Toyota has caused me to abandon much of what I learnt over 20 years as a consultant working with some of the biggest names in business. But a balance is required if you are to avoid serving the wrong customers and loosing a packet in the process. I look at business as a series of over lapping circles. The first Customer circle is what outcomes your customers are looking for. The second Capabilities circle is what you are good at doing. There should be lots of overlap in these two circles, or you are in deep trouble as you loose customers. The third Cashflow circle is how you make money by doing the first two circles. There should be lots of overlap in all three circles, or you are in even deeper trouble as you head for bankruptcy. You would be amazed how little most companies know about these three circles. I hope some senior managers at our domestic airlines read this. There's a phrase that I'm increasingly fond of trotting out when I see stuff like this: "misalignment of objectives". And I see it all the time, working as I do, mostly within the investment banking sector. For example, the business unit within which I work is constrained, often horribly, by our almost-but-not-quite-a-separate-entity of an infrastructure division. So we're less able to make money for the bank (and, as a consequence ourselves) because these folk have the wrong set of objectives. Not exactly their fault - the high-level objectives are set for them so that they become dog-waggers. So we find ourselves in a situation where cost control is more important than profit creation. Crazy. And the principal reason I can't stand to work in IT any more. Oh how I can agree with the IT issue. Our IT department didn't want any of the developers to have Mac's because they didn't want to support them. Except developers by nature need less support for their systems than someone from say, Finance. I also have a few thoughts on customer service at my blog. For people unfamiliar with the "wag the dog" idiom, it describes a situation where something unimportant (the tail of the dog) drives the behavior of something more important (the dog itself). There are so many places where they work on having the correct feature list but don't put it all together so the whole is useful. And it is really great to be a part of something that does pull it all together. For some reason my daughter has decided that Monsters, Inc. is the best movie ever and so we've watched it at least once a day since Friday. The funny thing is that I am not tired of it. It is a great film that really shows how it is supposed to be done. Then there are all the films that you're going "I paid money to waste this kind of time?" Home shows are also a lot of fun. I like to go to Parade of Homes and thought experiment how well the home would handle a turkey dinner with all the family, from bringing home the food, to parking, to storing the good china, cooking the meal and washing the linens. You know it's bad when you start laughing at the house at some step or another, but that is most homes nowadays. Windows vs. Mac need I say more. It just doesn't seem to matter but there are lots of people who want to hit checkboxes on feature lists and are totally unconcerned about how those features fit together. Sometimes it is also that the wrong things are being measured. I've been in a call center where the only metric is call time. A great way to boost your score was to just hang up. Simple, effective but not useful to anyone. Critical issue... Great Post regarding it! Another great post, Kathy. I always liked the way Shell at one time used to describe it. They pushed the idea of Grassroots Leadership, or in other words using the inputs of those who were at the coalface. In other words that's the front-line troops who are dealing with all those customers who are willing to give their money to the company. I said more on this in a reaction to a Seth Godin post, which I entitled Clueless Marketing Needs Grassroots Leadership. Kathy, I don't know how you do it -- once again you've hit the nail on the head for issues my office is facing *this minute*. Pardon a baseball analogy (Spring Training is upon us, after all), but you're in the zone of Sandy Koufax, circa 1963: just a great performance, every time out. Keep rockin'! Love you, just love you! i think this would make an appropriate bonus link... Who *is* that? I read a quote somewhere... "75% of HR managers consider hiring and retaining talent as their top priority"... what do the other 25% think their job is? 2) Sort of related, but the frustration in a company can go both ways. Developers may be frustrated with sys admins as they want to use certain tools to help the customers, but sys admins may have their own problems. It is hard to say any one side is correct without having a high amount of empathy and multi-faceted vision of the company and situations. I love your second-to-last paragraph as that really nails it. thoughtful post, and thanks to Matthew Wilson, i am just wondering the meaning of that idiom. I have seen how everything that Toyota does is driven by their customers. And I mean pretty much everything. Toyota has caused me to abandon much of what I learnt over 20 years as a consultant working with some of the biggest names in business.